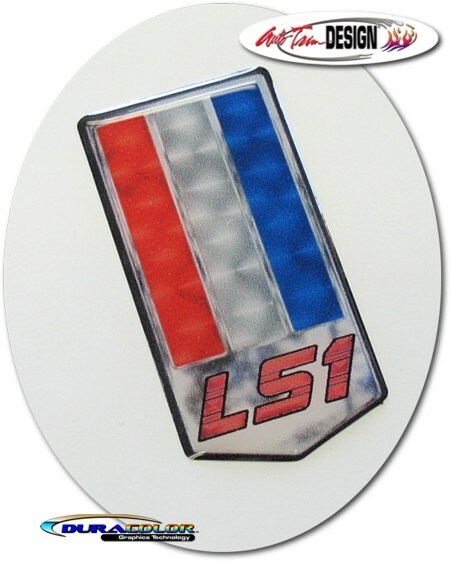 Ditch the old factory emblem and enhance your '82-'02 Chevrolet Camaro's front bumper with this awesome looking Red, White & Blue LS1 "domed" decal. "Domed" decals are not just vinyl decals. They are a tactile, three (3) dimensional polyurethane domed decal that look like a factory manufactured emblem. Skull and Fire image is simulated chrome on a simulated Black brushed metal background as shown. Chrome flames above skull are uniquely tinted Red, White & Blue. It's very easy to install (just remove your existing factory decal and stick!) and includes easy-to-follow general online instructions. Installation Tip: Surface of Bumper MUST be completely free from previous adhesive residue. Warming the Bumper surface and the rear of the decal slightly with a heat gun will promote good adhesion. Take care NOT to heat the Bumper or decal too much.